Go ahead, tell me, “What’s in your subconscious mind? What concepts does your subconscious mind hold to be true? What programs, acquired at a very early age, dictate your behavior? Why is your personality the way it is?” Stumped? Never thought about it? Why should you? The stuff in your subconscious mind is out of your conscious awareness, right? Thus, it is not important. You can’t do anything about it anyway, right? If you believe this, you are among the majority. Most people don’t think about their subconscious mind: they don’t care. After all, what a person doesn’t know about her or his subconscious mind won’t hurt, right? As long as they are sane, what’s in their subconscious mind is not important. Their, sane, rational, conscious mind is in control! WRONG! Your conscious mind is NOT in control, well, not always. Scientists who study the mind tell us that as much as 95 percent of our behavior and the decisions we make stem from the subconscious mind, not the conscious mind. You are thinking that thought with your conscious mind. So, yeah, that’s the 5 percent. But the truth is that the other 95 percent is in control. The strong emotional mind, which comprises around 90 percent of your total brain, not the puny 10 percent that you are conscious of, is in control. Your subconscious mind is a goal-seeking computer. (For an explanation, see pp. 62-72, The Genie Within: Your Subconscious Mind.) Your subconscious mind seeks to achieve the goals that it is given. To quote someone who knew a thing or two about the subconscious mind, Sigmund Freud said, “We learn as children how we react emotionally and this is carried into adulthood. When we are children, we do not have the faculties that we do in adulthood. We do not know what we are going to need in adulthood to cope. Therefore, as adults, we (often) react as children.” In other words, programs we learned as children were imbedded in our subconscious mind and are still in control. Do you ever lose your temper? Are you sometimes impatient? Do you shun a certain food for no (conscious) reason? If so, maybe you are reacting from a program that was imbedded in your subconscious mind years ago. If you are having trouble attaining a goal, such as losing weight, or advancing in your profession, it is likely that you have a counterproductive goal in your subconscious mind—one that is sabotaging your progress–and that you are totally unaware of. In this case, you are double-minded. That is, you have willed one goal in your conscious mind but your subconscious mind has an opposite goal. And guess which one always wins? The 95 percenter wins. This is the law: WHEN THE CONSCIOUS MIND AND THE SUBCONSCIOUS MIND ARE IN CONFLICT, THE SUBCONSCIOUS MIND ALWAYS WINS. The subconscious mind is eleven times bigger and it has the power, emotional power, which includes electrical and chemical elements. Your subconscious mind can be a big, bad-for-you bully. The conscious mind may have will, but the subconscious mind has the power. Power trumps will. Thus, when you are double-minded, you do not have willpower. If you want to succeed—in anything–you must become single–minded. You must change the goal, or concept, in your subconscious mind to be in concert with the desired one in your conscious mind. You need to make your subconscious mind your genie. 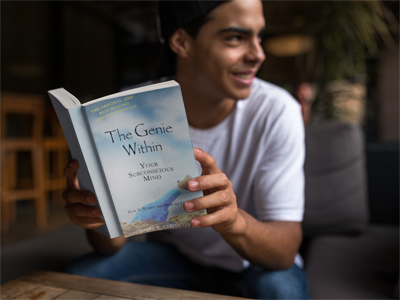 How to override old, counterproductive goals and concepts, in other words, how to make your subconscious mind your personal genie is fully explained in simple language in the book, The Genie Within: Your Subconscious Mind—How It Works and How to Use It. Harry Carpenter, author of The Genie Within: Your Subconscious Mind—How It Works and How to Use It.